It's nighty-nite for a favorite doll in Corolle's Mon Classique Canopy Cradle, the perfect size for any baby doll up to 17 inches tall (sold separately). 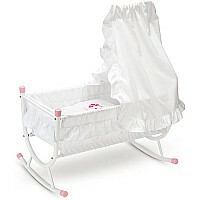 Designed in France and part of Corolle's Mon Classique Collection for little mommies ages 3 years and up, this pretty cradle includes a detachable ruffle-edged canopy plus a white pillow and blanket embroidered with a pink heart. Assembly required.